APCOMS offers you to be in charge throughout the process of getting access to the telecommunications network in your area (NBN, Telstra, Telstra Velocity, OPTICOM) of your new developments. • AFR / NBN Applications apply to new lots or subdivisions (LIC’s / Pit & Pipe). It doesn’t apply to remodeling and extensions. • A compliant design needs to be uploaded to applications. • Installations of the pit / conduits needs to be installed based on an approved design. 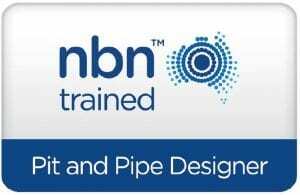 • For multilevel developments — NBN requires Internal design (Pathways). • Estimated time between application to installation of services by NBN / Telstra – up to 4 months. • Apply for the Certificate of Practical Completion. Peace of mind, knowing the 3PPP Network has been installed properly. Install communication pathway and wiring compatible with NBN. All maintenance and repairs. Install communication system allowing inter-connectivity between devices. NBN Compliant, maintenance and repairs. Our final plans are always compliant to network provider standards (Externals and Internals). Lead-in / Pit & Pipe / Internal Wiring Installation or Issue?